Mitesh Patel has been locked up for at least 30 years for the murder of his wife Jessica. Patel had denied murdering Jessica Patel at their matrimonial home on The Avenue, in Linthorpe. He had cheated on his wife with other men and planned to emigrate to Australia with his "soulmate". The 37-year-old pharmacist had staged a burglary and claimed an intruder had been the true killer, but evidence from his own CCTV and a health and fitness app on his phone exposed that as a lie. Patel will now spend life in prison with a minimum of 30 years behind bars. Jessica's family read out three statements about the loyal and devoted daughter and sister, before Mr Justice Goss delivered the sentence at Teesside Crown Court. While she rests in heaven, you will rot in hell." The public gallery at the court was so packed that members of the press were moved into the jury benches. Mr Justice Goss had warned Patel on Tuesday that he faced life imprisonment. Mitesh Patel showed no discernible reaction to the outcome of the 12-day trial walked silently from the dock with his hands clasped in front of him on Tuesday, after the news had been delivered. Patel strangled his 34-year-old wife to death in their Middlesbrough home on the evening of May 14. Then he ransacked his own home in a staged burglary, binding his wife's wrists and ankles with duct tape. 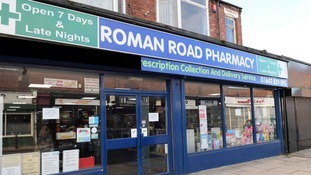 Prosecutors said he then headed to the pharmacy he and his wife owned on Roman Road to set up an alibi. He then texted his wife - a message he knew she could not read - about food, and ordered pizza to create the illusion of an ordinary evening. His 999 call, in which he cries and begs "come on baby, wake up", was when he first introduced the lie she had been murdered by an intruder. The court heard that Patel stood to make £2m from Jessica's life insurance policy. He had been in a relationship with another man, Amit Patel, said to have been a doctor in Sydney, and planned to emigrate to Australia and spend his life with the person he described as a "soulmate". And Patel had been unfaithful by cheating on Jessica with other men he met on the Grindr app, and other gay dating sites. He had searched 'I want to kill my wife' online and watched videos on strangulation. But after his lies unravelled, Patel will now spend decades inside.